We have already defined sound as any pressure variation that can be detected by the human ear. The number of pressure variations per second is called the frequency of sound, and is measured in hertz (Hz). The normal hearing for a healthy young person ranges from approximately 20 Hz to 20000 Hz (20 kHz). In terms of sound pressure levels, audible sound ranges from the threshold of hearing at 0 dB to the threshold of pain at 130 dB and over. Although an increase of 6 dB represents a doubling of the sound pressure, an increase of about 8 -- 10 dB is required before the sound subjectively appears to be significantly louder. Similarly, the smallest perceptible change is about 1 dB. Copyright © 2000 Brüel & Kjær Sound & Vibration Measurement A/S. This publication is protected by copyright law and international treaties. The contents may be copied and distributed in whole or in part provided that the source is stated and acknowledged to be Brüel & Kjær Sound &Vibration Measurement A/S. Brüel & Kjær Sound &Vibration Measurement A/S will not be held responsible for any direct or indirect loss or damage which may occur as a result of the use of this publication. This booklet deals with environmental noise -- for example, noise from industrial sites, road and rail traffic, airports and fairgrounds. It does not cover related issues such as building acoustics, building vibration or domestic noise. Neither does it cover human response to vibration nor industrial uses of sound and vibration measurements. Please contact your Brüel & Kjær representative to receive further information regarding these issues. While we have made every reasonable effort to present an up-to-date overview of standards, practices and methods, we cannot guarantee that we have covered all relevant aspects. Please consult your local authority to obtain further detailed information pertinent to your country, state, region or area. News stories related to environmental noise problems abound. Some stories are dramatic, most less so, but huge effort and great sums of money are often invested in conflicts involving environmental noise. Environmental noise is a worldwide problem. However, the way the problem is dealt with differs immensely from country to country and is very much dependent on culture, economy and politics. But the problem persists even in areas where extensive resources have been used for regulating, assessing and damping noise sources or for creation of noise barriers. For example, huge efforts have been made to reduce traffic noise at source. In fact, today’s cars are much quieter than those manufactured ten years ago, but the traffic volume has increased so much that the effect of this effort has been wiped out and the annoyance level has increased. Manufacturing quieter cars might have eased the problem for a period but it certainly hasn’t removed it. There are no worldwide estimates of the impact and cost of environmental noise. However, one prominent example covering most of Europe does exist -- the European Union’s Green Paper on Future Noise Policy (1996). Noise protection programmes differ from country to country. Legal requirements are not identical, techniques and methods differ, and political focus varies. However, there are common aspects to the work of all environmental noise officers. Planning new developments of residential areas, industrial sites, highways, airports, etc. These tasks are demanding and, considering the extent and significance of noise pollution, a proper level of understanding of the issues is required, not only from professionals working in the field but also from decision makers and citizens. This booklet is designed for all. The booklet presents the problems that arise when working with environmental noise and current solutions. Unfortunately, space prevents us from dealing with each subject in depth. We cannot, for example, cover national and regional legislation in detail. However, we have done our utmost to provide a comprehensive overview of the most important issues. Please feel free to contact your local Brüel & Kjær representative to learn more. Sound may be defined as any pressure variation that the human ear can detect. Just like dominoes, a wave motion is set off when an element sets the nearest particle of air into motion. This motion gradually spreads to adjacent air particles further away from the source. Depending on the medium, sound propagates at different speeds. In air, sound propagates at a speed of approximately 340 m/s. In liquids and solids, the propagation velocity is greater -- 1500 m/s in water and 5000 m/s in steel. Compared to the static air pressure (105 Pa), the audible sound pressure variations are very small ranging from about 20 µPa (20 × 10-6 Pa) to 100 Pa.
20 µPa corresponds to the average person’s threshold of hearing. It is therefore called the threshold of hearing. A sound pressure of approximately 100 Pa is so loud that it causes pain and is therefore called the threshold of pain. The ratio between these two extremes is more than a million to one. A direct application of linear scales (in Pa) to the measurement of sound pressure leads to large and unwieldy numbers. And, as the ear responds logarithmically rather than linearly to stimuli, it is more practical to express acoustic parameters as a logarithmic ratio of the measured value to a reference value. This logarithmic ratio is called a decibel or dB. The advantage of using dB can be clearly seen in the illustration on the next page. Here, the linear scale with its large numbers is converted into a manageable scale from 0 dB at the threshold of hearing (20 µPa) to 130 dB at the threshold of pain (~100 Pa). Our hearing is less sensitive at very low and very high frequencies. In order to account for this, weighting filters can be applied when measuring sound. The most common frequency weighting in current use is "A-weighting" providing results often denoted as dB(A), which conforms approximately to the response of the human ear. A "C-weighting" curve is also used, particularly when evaluating very loud or very low-frequency sounds. If the sound levels from two or more sound sources have been measured separately, and you want to know the combined sound pressure level of the sound sources, the sound levels must be added together. However, due to the fact that dBs are logarithmic values they cannot just be simply added together. Measure the Sound Pressure Level (SPL) of each noise source separately (Lp1 , Lp2). Find the difference (change in L) between these levels (Lp2 - Lp1). Find this difference on the horizontal axis of the chart. Move up until you intersect the curve, and then look at the value on the vertical axis to the left. Add the value indicated (L+) on the vertical axis to the level of the noisier noise source (Lp2). This gives the sum of the SPLs of the two noise sources. If three or more noise sources are present, steps 1 to 4 should be repeated using the sum obtained for the first two sources and the SPL for each additional source. Note that a change in L = 0 corresponds to the situation shown in the previous illustration where 3 dB was added to the level caused by one source alone. If the difference between the two sound pressure levels is more than 10 dB the contribution from the quietest source can be discarded. If change in L is less than 3 dB, the background noise is too high for an accurate measurement and the correct noise level cannot be found until the background noise has been reduced. If, on the other hand, the difference is more than 10 dB, the background noise can be ignored. At home and at work, we often hear noise from ventilation or heating systems that is hardly noticeable because it has no prominent features. The noise never stops and has no tone, but if the fan suddenly stops or starts to whine, the change may disturb or even annoy us. Our hearing recognises information in the sounds that we hear. Information we don’t need or want is noise. Noise features that make us listen and take notice are tones or changes in sound level. The more prominent the tone, and the more abrupt the change in sound level, the more noticeable the noise. When measuring noise, we need to know the type of noise so that we can choose the parameters to measure, the equipment to use, and the duration of the measurement. Often we need to use our ears to pinpoint the annoying features of the noise, before making measurements, analysing and documenting them. Continuous noise is produced by machinery that operates without interruption in the same mode, for example, blowers, pumps and processing equipment. Measuring for just a few minutes with hand-held equipment is sufficient to determine the noise level. If tones or low frequencies are heard, the frequency spectrum can be measured for documentation and further analysis. When machinery operates in cycles, or when single vehicles or aeroplanes pass by, the noise level increases and decreases rapidly. For each cycle of a machinery noise source, the noise level can be measured just as for continuous noise. However, the cycle duration must be noted. A single passing vehicle or aircraft is called an event. To measure the noise of an event, the Sound Exposure Level is measured, combining level and duration into a single descriptor. The maximum sound pressure level may also be used. A number of similar events can be measured to establish a reliable average. The noise from impacts or explosions, e.g., from a pile driver, punch press or gunshot, is called impulsive noise. It is brief and abrupt, and its startling effect causes greater annoyance than would be expected from a simple measurement of sound pressure level. To quantify the impulsiveness of noise, the difference between a quickly responding and a slowly responding parameter can be used (as seen at the base of the graph). The repetition rate (number of impulses per second, minute, hour or day) should also be documented. Annoying tones are created in two ways: Machinery with rotating parts such as motors, gearboxes, fans and pumps often create tones. Unbalance or repeated impacts cause vibration that, transmitted through surfaces into the air, can be heard as tones. Pulsating flows of liquids or gases can also create tones, caused by combustion processes or flow restrictions. Tones can be identified subjectively by listening, or objectively using frequency analysis. The audibility is then calculated by comparing the tone level to the level of the surrounding spectral components. The duration of the tone should also be documented. Low frequency noise has significant acoustic energy in the frequency range 8 to 100 Hz. Noise of this kind is typical for large diesel engines in trains, ships, and power plants and, since the noise is hard to muffle and spreads easily in all directions, it can be heard for miles. Low frequency noise is more annoying than would be expected from the A-weighted sound pressure level. The difference between the A-weighted and C-weighted level can indicate whether there is a low frequency problem. To calculate the audibility of low frequency components in the noise, the spectrum is measured and compared to the threshold of hearing. Infrasound has a spectrum with significant components below 20 Hz. We perceive it not as sound but rather as pressure. The assessment of infrasound is still experimental, and is presently not covered by international standards. How loud is a 10-ton truck? That depends very much on how far away you are, and whether you are in front of a barrier or behind it. Many other factors affect the noise level, and measurement results can vary by tens of decibels for the very same noise source. To explain how this variation comes about, we need to consider how the noise is emitted from the source, how it travels through the air, and how it arrives at the receiver. To arrive at a representative result for measurement or calculation, these factors must be taken into account. Regulations will often specify conditions for each factor. If the dimensions of a noise source are small compared with the distance to the listener, it is called a point source, for example, fans and chimney stacks. The sound energy spreads out spherically, so that the sound pressure level is the same for all points at the same distance from the source, and decreases by 6 dB per doubling of distance. This holds true until ground and air attenuation noticeably affect the level. If a noise source is narrow in one direction and long in the other compared to the distance to the listener, it is called a line source. It can be a single source such as a long pipe carrying a turbulent fluid, or it can be composed of many point sources operating simultaneously, such as a stream of vehicles on a busy road. The path difference of the sound wave as it travels over the barrier compared with direct transmission to the receiver (a + b - c, in the diagram). The frequency content of the noise. The combined effect of these two is shown in the diagram. It shows that low frequencies are difficult to reduce using barriers. The first two factors mentioned above are the most influential and are shown in the diagram below. To summarise, low frequencies are not well attenuated by atmospheric absorption. Wind speed increases with altitude, which will bend the path of sound to "focus" it on the downwind side and make a "shadow" on the upwind side of the source. At short distances, up to 50 m, the wind has minor influence on the measured sound level. For longer distances, the wind effect becomes appreciably greater. Downwind, the level may increase by a few dB, depending on wind speed. But measuring upwind or sidewind, the level can drop by over 20 dB, depending on wind speed and distance. This is why downwind measurement is preferred -- the deviation is smaller and the result is also conservative. Temperature gradients create effects similar to those of wind gradients, except that they are uniform in all directions from the source. On a sunny day with no wind, temperature decreases with altitude, giving a "shadow" effect for sound. On a clear night, temperature may increase with altitude, "focusing" sound on the ground surface. Sound reflected by the ground interferes with the directly propagated sound. The effect of the ground is different for acoustically hard (e.g., concrete or water), soft (e.g., grass, trees or vegetation) and mixed surfaces. Ground attenuation is often calculated in frequency bands to take into account the frequency content of the noise source and the type of ground between the source and the receiver. Precipitation can affect ground attenuation. Snow, for example, can give considerable attenuation, and can also cause high, positive temperature gradients. Regulations often advise against measuring under such conditions. When sound waves impact upon a surface, part of their acoustic energy is reflected from it, part is transmitted through it and part is absorbed by it. If absorption and transmission are low, as is generally the case with buildings, most of the sound energy is reflected and the surface is said to be acoustically hard. The sound pressure level near the surface is therefore due to direct radiation from the source and sound arriving from one or more reflections. Typically, the level 0.5 m from a plain wall is 3 dB(A) higher than if there was no wall. Regulations often require the exclusion of the effect of reflection from reported results (free-field conditions). When at home, some people like to keep their windows closed -- because of climate or tradition. Disturbing noise in the environment is then attenuated by the building, typically offering 20 - 30 dB of protection (façade sound insulation). Windows are often acoustically weak spots, but can be improved with special design. In other countries and climates, people are used to having their windows open and experiencing the full effect of environmental noise. Regulations for environmental noise, therefore, must take into account both the way dwellings are constructed and the way they are used. Noise assessment is generally about evaluating the impact of one specific noise source, for example, the noise from a specific production plant. This is not always an easy task. In practically every environment, a large number of different sources contribute to the ambient noise at a particular point. Ambient noise is the noise from all sources combined -- factory noise, traffic noise, birdsong, running water, etc. Specific noise is the noise from the source under investigation. The specific noise is a component of the ambient noise and can be identified and associated with the specific source. Residual noise is ambient noise without specific noise. The residual noise is the noise remaining at a point under certain conditions when the noise from the specific source is suppressed. This terminology derives from ISO 1996 and is commonly used. The term background noise (not used in ISO 1996) is also a common one but should not be confused with residual noise. It is sometimes used to mean the level measured when the specific source is not audible and sometimes it is the value of a noise parameter, such as the L A90 (the level exceeded for 90% of the measurement time). In the context of building planning, the term initial noise is used to denote the noise at a certain point before changes, for example, the extension of a production facility or the building of barriers, are implemented. A variety of methods are used to assess specific noise, many of them described in this booklet. These methods can range from the drastic, such as the shutting down of a production plant to isolate the residual noise, to sophisticated systems that include simultaneous and correlated measurements at several points close to and away from the source. The measured noise is often recorded on a Digital Audio Tape (DAT) recorder or directly onto a PC in order to identify and document the noise source. Objective measurements of sound levels are an indispensable part of any environmental noise protection program. 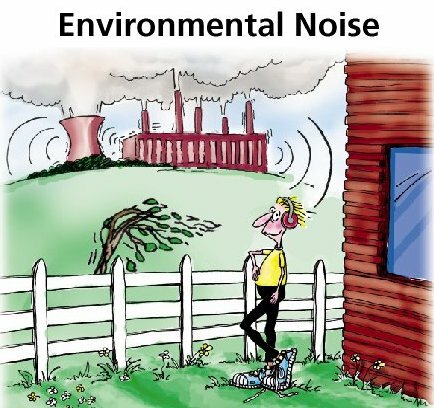 Environmental noise levels vary greatly -- noise is often impulsive or contains pure tones. In addition, disturbances from extraneous sources of noise -- be it barking dogs, flyovers, or children playing -- must be handled one way or another. Standards and regulations specify which parameters must be measured, and in most cases they also prescribe how to set up measurement equipment and handle various factors such as meteorological conditions. On top of this, certain "good practices" exist. The result of a noise assessment is never simply a figure such as 77 dB. It is the value of specific parameters or indicators obtained under known and documented conditions. Assessing a fluctuating noise level means getting a value for a level that is, in simple terms, the average level. Eyeball-averaging using a moving-coil instrument is a method of the past. The LA50, i.e., the level exceeded for 50% of the measurement time, is now only rarely used as an average value. The "equivalent continuous sound level", the Leq , is known across the globe as the essential averaged parameter. The Leq is the level that, had it been a steady level during the measurement period, would represent the amount of energy present in the measured, fluctuating sound pressure level. The Leq is measured directly with an integrating sound level meter. Leq is a measure of the averaged energy in a varying sound level. It is not a direct measure of annoyance. Extensive research, however, has shown the Leq to correlate well with annoyance. It is obvious, though, that a noise level acceptable on a Wednesday afternoon may be distressing early on Sunday. Corrections for time of day may, therefore, be applied. An analysis of the statistical distributions of sound levels is a useful tool when assessing noise. The analysis not only provides useful information about the variability of noise levels, but is also prominent in many standards as the basis for assessing background noise. For example, L90, the level exceeded for 90% of the measurement time, is used as an indicator of background noise levels while L 10 or L5 are sometimes used to indicate the level of noise events. 7 Day or Two Hour Measurements? Measuring noise for the complete reference time interval is ideal. This could range from two hour to week-long measurements. Longer periods such as month and year-long measurements are sometimes used for good reason. In such cases, a log of values obtained every second, minute or quarter of an hour is used to obtain a time history of noise levels. However, long-term measurements can be expensive and difficult to manage. Assessments are often based on taking measurements of representative samples and piecing together the results into a complete overview. Working out a full evaluation from representative samples is indeed a daunting task. State-of-the-art software can automate the process providing accurate and reliable results efficiently and cost-effectively. However, if regulations impose absolute limits on maximum levels, a continuous monitoring of sound levels is necessary. The L eq or, better, the LAeq(the A-weighted equivalent continuous sound level) is the most important parameter. Broadband measurements, i.e., measurements covering the whole of the audible frequency range, are made using the "A" frequency weighting when assessing environmental noise. It is good practice to always state the applied frequency weighting. Noise with distinct tones, for example, noise from fans, compressors, or saws, is generally far more annoying than other types of noise. This annoyance factor is not taken into account in a broadband measurement. A spectral analysis may be needed to assess annoyance. Pure tones can be assessed subjectively, as the human ear is good at detecting tones. Regulations often require an objective measurement of tonal content as well. In practice, this is either done by 1/3-octave analysis or narrow-band analysis (FFT -- Fast Fourier Transform). Legislation often specifies where measurements should be made, for example at property boundaries or at a complainant’s property. Other factors also need to be taken into account when measuring because sound levels vary at different heights above ground level. They will also vary depending on the distance between the measurement point and facades and obstacles. These requirements must be noted and applied. However, measurements can be made at the façade or at other specified heights (the European Union is considering making 4 m the standard). It is common practice to calibrate sound level meters using an acoustical calibrator before and after each series of measurements. For professionals, the sound level meter and the calibrator go together. But to ensure continuing accuracy, and for validity in court cases, more detailed calibrations and checks are required. The annoyance due to a given noise source is perceived very differently from person to person, and is also dependent upon many non-acoustic factors such as the prominence of the source, its importance to the listener’s economy and his or her personal opinion of the source. For many years, acousticians have attempted to quantify this to enable objective assessment of noise nuisances and implement acceptable noise limits. When large numbers of people are involved, reactions tend to be distributed around a mean, and the Rating Level (L r ) parameter has been developed in an attempt to put a numerical value on a noise to quantify its annoyance in relation to the general population. The Rating Level is defined in the ISO 1996-2 standard (see section on International Standards). It is basically a measure of the noise exposure corrected for factors known to increase annoyance. It is used to compare measured levels with noise limits that usually vary depending on the use of the property under investigation (see section on Assessment). The basic parameter is the A-weighted equivalent continuous sound pressure level or LAeq. ISO 1996-2 states that the Rating Level has to be determined over reference time intervals related to the characteristics of the source(s) and receiver(s). These reference time intervals are often defined in national/local legislation and standards. The way to measure and evaluate the penalties is different from country to country, but the basic principles are the same and are described in the next section. Current research into the relationship between the source of noise and its reaction focuses on many issues, one of which is the concept of soundscape design where the subjective pleasantness of urban soundscapes is compared to physical parameters in much the same way as in product noise design. Soundscape design combines the talents of scientists, social scientists, architects and town planners. It attempts to define principles and to develop techniques by which the quality of the acoustic environment or soundscape can be improved. This can include the elimination of certain sounds (noise abatement), the preservation of certain sounds (soundmarks) and the combination and balancing of sounds to create attractive and stimulating acoustic environments. Rating Level Lr -- How Much is Too Much? International standards describe how to determine the Rating Level L r , but do not set legal limits. These are regulated individually by country or local authority. Differences in lifestyle, climate (outdoor activities, open or closed windows) and building design make international harmonisation of noise limits impossible. Zones similar to those in the figure above are used universally, and specify different limits depending on the type and use of the area under investigation. Absolute limits are used in most countries. They compare the Rating Level L r to a fixed limit such as 50 dB(A). Relative limits are used in, for example, the UK. They compare the Rating Level L r to the background noise, measured as LAF90. Almost all countries use the Rating Level Lr according to ISO 1996 when assessing industrial noise. However, in Japan, the L50 is used, while Belgium uses L95. The limit is normally in the 50 - 55dB(A) range. The Rating Level Lr is calculated from LAeq, the equivalent continuous A-weighted sound pressure level, with adjustments (penalties) KT for tonal components and KI for impulsive noise. The reference time periods vary from country to country. Some use just day and night, some combine day and night, and others have resting periods as well. Different assessment procedures are used for each reference time period. A loudest time period is used in some countries to penalise intermittent noise. The duration of this period ranges from 5 minutes to one hour, depending on the country. The penalty for tones varies between 0 dB (no penalty) and 6 dB. Some countries use a single penalty value of 5 dB, while other countries use two or more steps. In most cases, the presence of tones is determined subjectively, but objective methods are increasingly used. These methods are based on 1/3-octave or FFT (Fast Fourier Transform) analysis. The maximum penalty for impulsiveness can vary up to 7 dB between countries, and both subjective and objective methods are used. The objective methods are based on the difference between a fast reacting and a slower reacting measurement parameter (e.g., between Impulse and Fast A-weighted levels) or it can be based on the type of source, using a list enumerating noise sources (such as hammering, explosives, etc.). Road traffic is the most widespread source of noise in all countries and the most prevalent cause of annoyance and interference. Therefore, traffic noise reduction measures have the highest priority. LAeq is the preferred noise index, but Rating Level Lr and percentile levels L10 and L50 are also used. For dense traffic, it can be assumed that L10 is about 3 dB above LAeq, and L50 about 1 - 2 dB lower. Assessment is carried out using various reference time intervals depending on the country. These intervals range from one 24-hour period to three separate intervals for day, rest and night. Generally the night limits are the most difficult to fulfil. The table shows the planning limits for new roads in various countries. The limits are often above the level of 50 - 55 dB(A) recommended by WHO (World Health Organisation), so the expansion of "grey" areas is inevitable almost everywhere. As with road traffic noise, LAeq is the preferred index for rail traffic noise. In some countries, Rating Levels are calculated from LAeqby subtracting (normally) 5 dB, the so-called railway bonus. In Japan, LASmax is used for the Shinkansen high-speed line. Generally, using maximum levels as the only limit has the disadvantage of disregarding the number of trains. Assessment is carried out using various reference time intervals depending on country. These intervals range from one 24-hour period to three separate intervals for day, rest and night. The noise limits for new lines in residential areas vary between 60 and 70 dB. In some countries, the railway bonus is included in the limit values. The railway bonus is based on social surveys from several countries, comparing the annoyance from road and rail traffic. The effect is more pronounced at higher levels. The above graph shows dose-effect relationships for air, rail and road traffic. The percentage of highly annoyed persons is plotted against LDN levels (LAeqwith a 10 dB penalty for night time exposure between 22:00 and 07:00). It illustrates the lower annoyance caused by railway noise and the higher annoyance caused by air traffic noise, compared to road traffic noise for the same value of LDN . Due to the large spread of the underlying data, the graph is for illustration only. The most important tool for noise control at airports is noise zoning for land-use, planning and noise insulation programs. Noise from commercial aircraft is only a problem around airports as this is where aircraft converge at low altitude and high engine power. Increasing air traffic and city expansion will exacerbate the noise problems, while aircraft noise reduction, traffic and flight path restrictions can alleviate them. As a last resort, existing dwellings can be protected against noise by improving windows and roofs. Noise contours are used to show the extent and location of noise problem areas. The number shown with each contour indicates the noise level exceeded within that contour. Superimposed on a map, and compared to noise limits, they pinpoint areas in need of noise reduction measures. Noise footprints show the noise contours for a single aircraft or class of aircraft. Noise footprints can be calculated from noise data for each aircraft and take into consideration flight path, aircraft operation and landscape features. They serve to assess the present and projected noise impact and help plan noise reduction measures. Noise contours around an airport calculated using INM (Integrated Noise Modelling) based on previous noise measurements. One of the most undervalued aspects of evaluating noise is the reporting of results. Quite often, only marginal data, such as a few discrete dB values, is reported. Consequently, important information is missing, making report interpretation difficult. The level of detail in a report must be consistent with the purpose of the report to its readers. To make a full and coherent report you need to pay careful attention to the actual situation under which the measurement is made. Standards and recommended practices are Agreat help when making a measurement report. The following standards lay out the framework for what information you must record and what information you are recommended to record. It is also important to write the report in an easy-to-understand, readable style. Depending on your target audience, the use of graphics, sketches, and illustrations can sometimes help to explain the data. In other cases, text and figures will suffice. If you produce many measurement reports, it is vital that you carefully archive your data. Structured bookkeeping may prove essential when old data must be retrieved for comparison with new data. A number of professional PC-software packages fulfil contemporary bookkeeping demands. Import of data from measurement equipment, preparation of structured reports, easy archiving and retrieval of data, and direct printing and exporting facilities are made easy with these software programs, saving the professional acoustician valuable time. Noise levels at a receiver point can be calculated instead of being measured. In addition, noise propagation from one measurement point to another can also be calculated. Calculation is normally performed in accordance with a recognised standard algorithm. This is usually determined nationally, or by industry sector, and often depends on the type of source. The algorithms are often source-related, limiting them to use with just that particular source. An exception to this rule is the internationally accepted ISO 9613 standard that determines levels at receiver points based on the sound power levels of identified sources. Being defined in sound power levels makes the standard independent of source type (although there are limitations regarding highly impulsive sources and those with high speed). The algorithms have normally been verified by numerous measurements and over a range of test case scenarios and allow accuracies (uncertainty) of 3 dB, similar to that achievable with measurements. Although more advanced methods are available, most standardised algorithms in widespread use are empirical and based on simple rules of physics. In fact, many of them can be implemented with pen and paper. However, with the large number of calculation points and sources normally encountered, computers are used, enabling faster calculation, analysis, presentation and reporting. Calculations are made using a computer model of the environment with defined noise sources, topography and features that affect the propagation of the noise to (receiver) points of interest. One or more calculation points are put into the model and the computer is then asked to evaluate the noise levels in the model. Normally, long-term LAeqlevels are calculated although octave-band levels may also be available. All this can be done as a broadband (dB(A)) calculation or in octaves and subsequently summed to give the broadband level. In general, octave-band calculations are more accurate and more useful in subsequent analysis and in any noise reduction required. Like measurements, the calculation should also be calibrated. This usually involves some form of valid measurements at selected positions where the measured levels can be compared to the calculated ones. However, unlike measurements, calibration of a calculation is performed after the first calculation and used to refine results to the optimal accuracy. Care should be taken that the source activity during the measurement is the same as that calculated. The calculation normally includes a long-term weather correction to obtain a long-term, average LAeqlevel. Comparing measurements and calculations, however, should be done under stable weather conditions with the wind blowing from source to receiver (downwind). Using results from a single day’s measurement may give systematic errors caused by non-representative wind conditions and the state of groundcover. This error can be up to 10 dB. In addition, measured data is not source-specific and includes contributions from sources other than those under investigation. Longer-term monitoring and post-processing of results to "remove" unwanted contributions are recommended. In some cases, for example when investigating possible future scenarios, validation with measurements is not possible. Here, careful analysis of the results, or comparison with similar situations, is required to ensure optimal accuracy. The accuracy of a particular calculation is dependent on several factors. The most important of these are scenario, levels, range, inputs and user skill. Algorithms are optimised for use within a range of scenarios. In particular, road and rail traffic noise calculation standards are based on national databases of traffic noise emissions and can be limited in use in other countries where, in particular, the age and mix of the vehicles in use and driving/operating conditions are different. Thus, accuracy may vary with calculated noise level, with the optimal accuracy occurring over a smaller or wider range of noise levels. However, most algorithms include provisions for ensuring accuracy over a wide range of noise levels. A bigger problem is to ensure the quality of input data as the accuracy of the result is highly dependent on this. Topographical data, machinery sound power levels and traffic flow data are areas in which care should be taken. By using up to date GIS or AutoCAD files to generate topographical data, measuring sound power levels on site, and performing traffic flow counts at selected check points, you can reduce the risk of erroneous data. Finally, user skill and experience, both with environmental noise assessment and with the calculation algorithm itself, play an important part in optimising the result. Used correctly within the range of scenarios for which they have been designed, the algorithms ensure global accuracies to within 3 dB. Like measurement, calculation can be used in environmental noise assessment. Additional uses include identifying prominent sources for noise reduction, noise management through investigations of the effect of future changes in noise environment, and noise mapping (see next section on planning). In many countries, an Environmental Impact Assessment must be made before, for example, planning permission for a new factory or motorway extension is approved. There is often a requirement to evaluate the noise impact either by preventing a fixed limit from being exceeded, or by weighing the impact of noise and other environmental factors against the socio-economic benefits of the proposal. This may lead to the development of alternative proposals to improve the environmental impact before approval. A Weighted Noise Index quantifies the noise annoyance factor local residences are subjected to by the noise source under investigation. It can be designed such that a Weighted Noise Index of 0 indicates acceptable levels since the levels are all under the recommended limits. An example of a Weighted Noise Index can be found in the Danish regulations for the assessment of new roads. To calculate a typical Weighted Noise Index, group the properties in the area under investigation by usage (e.g., residential, commercial or industrial). Classify the number of properties with noise levels in 5 dB categories. Multiply the number of properties in each category by an annoyance factor determined by the noise level. The higher the noise level, the higher the annoyance factor. Adding the above indices for the different property classes results in an overall Weighted Noise Index that can be used to assess the environmental noise impact of the development and to compare the alternatives. The lower the Weighted Noise Index, the less noise impact the proposal has. Some indices use the number of inhabitants instead of number of residences, thus giving a Population Noise Exposure Index. An example of this is the Noise Impact Index proposed by the US National Academy of Sciences. In Switzerland, when assessing environmental noise reduction activities, the efficiency of the solution in reducing noise to the required levels is compared to its cost-efficiency. If the solution reduces the noise to below the legal limits at all selected sites and has a high cost-efficiency, it will be implemented. If it does not reduce the noise to below the legal limits at any site and/or is not cost-efficient, it will not be implemented. There is Agrey area where the decision will be influenced by other factors (see the figure below). Global, or strategic, noise planning tries to prevent noise issues arising and to optimise the use of limited resources by mapping and managing the noise environment of a large area such as a city. Noise mapping is already in widespread use for the purpose of managing airport noise. Here, the 65 dB and 55 dB "footprints" of the airport are used to determine planning approval for new runways and compensation for nearby residents. At the time of going to press, the European Union is in the process of developing a European Union Noise Policy based on the Noise Policy Green Paper from 1996. This will give directions on the use of noise maps, what noise maps to produce and how to produce them. Noise maps are proposed as showing LDEN and Lnight (the night-time LAeq) of each type of source (road, rail, industry, etc.) at a height of 4m over the ground. Aggregation of levels from different sources can be performed with a stated method. The European Union is working towards all cities with more than 250000 inhabitants making maps of transportation and industrial noise using current models. Later, these cities are to make noise maps using harmonised techniques. The most common source of environmental noise is road traffic. Road traffic noise accounts for more than 90% of unacceptable noise levels (daytime LAeq> 65 dB(A)) in Europe. Other forms of transportation noise such as train and aircraft noise is a more local problem but can still annoy many people. Outdoor noise levels usually decrease with increasing distance from the source because of geometrical spreading of the noise energy over a bigger surface and absorption of the noise by the atmosphere and by the ground. Barriers can achieve additional reduction of noise levels. The sound insulation of buildings is the final barrier to the potentially intruding effects of environmental noise. Most countries encourage manufacturers to produce quieter cars and lorries by imposing noise limits on individual vehicles. These "pass-by" noise-rating limits have been reduced over the past 20 -- 30 years by approximately 8 dB(A) for cars and 15 dB(A) for lorries. Some national governments (e.g., Norway and Italy) have implemented legislation to include tests on noise emission from vehicles during normal service. These tests are usually carried out by garages as part of general tests on the condition of the vehicle; others perform spot checks. Even so, the ever-increasing number of vehicles means that the overall noise levels have not been reduced. Road surfaces can be improved to give lower noise output. Porous asphalt and the newer "thin noise-reduced surfaces" have shown reductions of 2 - 6 dB(A). Railway noise can be reduced by the use of welded rail track laid on a concrete bed with elastic/resilient pads or mats. The obvious method of reducing noise is to move people as far away as possible from the sources of environmental noise. However, this is often impractical, so additional attenuation in the form of noise barriers can be applied. The barrier height and the position of the source and/or receiver relative to it are crucial to the amount of noise reduction that can be achieved. Effective barriers with heights ranging from 1.5 m (Japanese railway noise) to 10 m (US ground-based airport operations) have been reported. Barrier heights for road traffic noise reduction are typically between 3 and 7 m. In addition, the frequency spectrum of the noise source will affect the achievable reduction. Low frequencies, compared to high frequencies, are poorly attenuated by barriers. In some cases, the performance of barriers can be improved by applying sound absorbing material, avoiding parallel, reflective surfaces and shaping or angling barriers to avoid multiple reflections. The final stage of ensuring that people are not disturbed by environmental noise in their homes is to provide sufficient sound insulation from the external noise levels. This is called Façade Sound Insulation, and is measured in terms of a Standardised Level Difference (DnT,tr) or the Sound Reduction Index (R'tr). Why be on the Spot? Today’s automatic equipment can be left in the field to record environmental noise data, and send reports back to the operator in the comfort of his office. This is often the most convenient and economical way to evaluate noise conditions, and is necessary if long-term or simultaneous measurements are required. Often, a combination of attended and unattended measurements is the most efficient solution, using attended measurement for pilot studies and spot checks, and unattended measurements for long-term or permanent noise monitoring. Permanent, 24 hour a day, 365 days a year, noise monitoring controls adherence to noise limits and allows a wide range of additional benefits. Permanent noise monitoring is used by an ever-growing variety of organisations. For many major airports, permanent noise level monitoring is a key issue in the daily running of the airport as noise is often the number one complaint from neighbouring residents. Airport authorities have established regulations with the aim of reducing the impact caused by their operations as much as possible. They hope that these regulations will not only give them the ability to ensure that aeroplanes and pilots adhere to their regulations, but also prevent complaints. It is often necessary to have both noise data and information about the trajectories followed by approaching or departing aeroplanes. Normally, the airport’s own radar provides the required information and, once correlated with noise data, it can easily be used to determine excess noise levels for specific aeroplanes. It is usually used when strict noise limits are imposed by the authorities or to protect against law actions, complaints and compensation claims. Permanent monitoring can indicate noise trends and help produce noise maps. These systems ensure automatic, round-the-clock data acquisition, collecting noise information and other relevant environmental parameters. All measurement results are collected and stored in a monitoring terminal and transferred periodically to a central computer where all data is processed and stored. The number of permanent, monitoring system terminals necessary will depend on the area covered as well as on specific monitoring needs. Many systems have between 10 and 30 terminals, although 100-terminal systems do exist. A noise-monitoring terminal basically consists of a weatherproof microphone, a data analysis and storage device and an information transmission system such as a land phone line. Commonly used analyzers measure a range of noise parameters including running LAeqand LN levels as well as noise event detection. Some provide 1/3-octave band frequency analysis in real-time allowing immediate calculation of indices such as LPN perceived noise levels of each aircraft flyover. Permanent monitoring terminals are often fast-wired to a control centre for viewing and analysing data from several positions. Short-term and/or long-term average noise levels may be shown on a public display system to create public awareness and positive Public Relations for the authority concerned. Alternatively vans can be used as mobile terminals. These units, possibly with automatic positional identification, often have data transfer facilities via phone lines to a computer. In all cases, Type 1 instrumentation is essential for these data gathering operations (see section on International Standards, IEC 60651). Because they are used over long periods of time, monitoring stations are susceptible to the effects of humidity, temperature, wind, corrosive atmosphere and animals. The microphone is particularly vulnerable, as it is the most exposed part of the system. To prevent damage, a special weatherproof microphone unit made of corrosive-resistant materials and with built-in protection against humidity is recommended. It is also advantageous if the noise monitoring system can automatically perform acoustical verification as well as system checks, for example, a charge injection calibration (CIC) to check that it is working properly. Permanent monitoring systems normally have extensive databases for analysis, impact research and status evaluation including periodical results. Noise events and complaints can be correlated and combined with GIS (Geographic Information System) digital cartography to show population exposure and allow high-quality presentation. International standards are important in the assessment of environmental noise either because they are used directly or because they provide inspiration or reference for national standards. This section highlights some of the more important standards. There are two main international bodies concerned with standardisation. The International Organization for Standardization (ISO) deals primarily with methodology to ensure that procedures are defined to enable comparison of results. The International Electrotechnical Commission (IEC) deals with instrumentation to ensure that instruments are compatible and can be interchanged without major loss of accuracy or data. It defines the basic terminology including the central Rating Level parameter and describes best practices for assessing environmental noise. ISO 1996 is currently under revision with focus on updating measurement techniques to modern instrumentation, improving procedures, such as for identifying tones, and providing information on research in the effect of noise levels from different sources. ISO 3891: "1978 Acoustics -- Procedure for Describing Aircraft Noise Heard on the Ground" deals with how to monitor aircraft noise (noise measurement and recording, data processing and reporting). It is currently under revision and is expected to cover the description and measurement of aircraft noise heard on the ground, unaccompanied long-term and short-term monitoring of aircraft noise, and airport noise management and land use. It defines an octave-based calculation method based on point sources with a defined sound power level. Line sources can be built up with point sources. These three standards are grouped together as they all deal with sound level meters. International standards for sound level meters are accepted by all countries worldwide. They are important because all measurement standards refer to sound level meter standards to define the instrumentation required. In most countries, Type 1 equipment is required for environmental noise measurements. IEC 60651 -- Sound level meters (1979, 1993): Defines sound level meters in four degrees of precision (Types 0, 1, 2 and 3). Specifies characteristics including directionality, frequency and time weighting, and sensitivity to various environments. Establishes tests to verify compliance with the characteristics specified. IEC 60804 -- Integrating-averaging sound level meters (1985, 1989, 1993): Additional standard to IEC 651 that describes this type of instrument (i.e., those that measure L eq ). IEC 61672 -- Sound level meters: A new, draft IEC sound level meter standard that will replace IEC 60651 and IEC 60804. Major changes: Tougher specifications, Type 3 disappears. It should mean improved test and quality control of instrumentation and improved accuracy. A wide range of parameters are used to assess community reaction to environmental noise. The highly variable response of individuals to environmental noise and the many characteristics (level, frequency content, impulsiveness, intermittency, etc.) of different types of noise sources has led to many attempts to provide single-number ratings of the effect of that noise. The following list summarises most of the parameters in common usage. "A" frequency weighting: The method of frequency weighting the electrical signal within a noise-measuring instrument is to simulate the way the human ear responds to a range of acoustic frequencies. It is based on the 40 dB equal loudness curve. The symbols for the noise parameters often include the letter "A" (e.g., LAeq) to indicate that frequency weighting has been included in the measurement. LAeq,T : A widely used noise parameter that calculates a constant level of noise with the same energy content as the varying acoustic noise signal being measured. The letter "A" denotes that the A-weighting has been included and "eq" indicates that an equivalent level has been calculated. Hence, LAeqis the A-weighted- equivalent continuous noise level. LAE : Sound Exposure Level (SEL): A parameter closely related to LAeqfor assessment of events (aircraft, trains, etc.) that have similar characteristics but are of different duration. The LAE value contains the same amount of acoustic energy over a "normalised" one second period as the actual noise event under consideration. LAFMax, LASMax or LAIMax : Maximum A-weighted noise level measured with Fast (F), Slow (S) or Impulse (I) time weighting. They are the highest level of environmental noise occurring during the measurement time. They are often used in conjunction with another noise parameter (e.g., LAeq) to ensure a single noise event does not exceed a limit. It is essential to specify the time weighting (F, S or I). LAFMin , LASMin or LAIMin : Minimum A-weighted noise level measured with Fast (F), Slow (S) or Impulse (I) time weighting. They are the lowest level of environmental noise occurring during the measurement time. LAFN,T Percentile levels: The level of A-weighted noise exceeded for N% of the measurement time. In some countries the LAF90,T (level of noise exceeded for 90% of the measurement time) or LAF95,T level is used as a measure of the background noise level. Note that the time weighting (usually Fast) should be stated. In some countries, a subjective assessment of the characteristics of the noise in question is made. In other countries, an objective test is made to see whether the noise is tonal or impulsive. For example (1) a 1/3-octave frequency band of noise which exceeds the levels in adjacent bands by 5 dB or more for the detection of tonal noise and, (2) a measurement of the difference between and Impulse and A-weighted "Leq" parameter (LAIm,T) and LAeq,T would reveal the presence of impulses. Aircraft Noise Parameters: If aircraft noise is assessed as just a normal noise source (as is usually the case), then the usual environmental noise parameters required are LASMax and LAE (equivalent to LAX in some older standards) for single events and LAeq,T for a succession of noise events. In some cases (e.g., aircraft certification), more detailed analysis of the 1/3-octave spectral content of the aircraft noise is made at 0.5 second intervals. Perceived noise level (LpN ) is then calculated by converting the sound pressure levels to perceived noisiness values according to the ICAO Annex 16 standards. If the aircraft noise spectrum has pronounced tonal content, then an additional correction of up to 6.7 dB is added to the perceived noise level (LpN ) to give a tone-corrected perceived noise level LTPN. The total subjective effect of an aircraft’s flyover must take into account the time history of the flight. This is accounted for by integrating the tone-corrected, perceived noise level to produce the effective perceived noise level, LEPN. Full details can be found in the ISO 3891 standard. LDN: Day-night average sound level. An LAeqwith 10 dB(A) penalty for environmental noise occurring from 22:00 to 07:00 to take account of the increased annoyance at night. Frequency spectrum: In environmental noise investigations, it is often found that the single-number indices, such as LAeq, do not fully represent the characteristics of the noise. If the source generates noise with distinct frequency components (tonal noise), then it is useful to measure the frequency content in octave, 1/3-octave or narrower (Fast Fourier Transform) frequency bands. For calculating noise levels (prediction), octave spectra are often used to account for the frequency characteristics of sources and propagation. Sound power is the acoustic power (W) radiated from a sound source. This power is essentially independent of the surroundings, while the sound pressure depends on the surroundings (reflecting surfaces) and distance to the receiver. If the sound power is known, the sound pressure at a point can usually be calculated, while the reverse is true only in special cases (e.g., in an anechoic or reverberation room). So, the sound power is very useful to characterize noise sources and to calculate sound pressure. Like sound pressure, sound power is measured in logarithmic units, the 0 dB sound power level corresponding to 1 pW (picowatt = 10 -12 W). The symbol used for sound power level is LW, and it is often specified in dB(A), 1/1 octaves or 1/3 octaves. Brüel & Kjær was founded by two Danish engineers, Per V. Brüel and Viggo Kjær, in 1942. For more than 50 years, sound and vibration measurements have formed the core of our activities. Brüel & Kjær is a leading supplier of microphones, accelerometers, analyzer systems, sound level meters and calibration systems worldwide. Hand-held sound level meters were made commercially available in 1961 and, ever since, Brüel & Kjær has been the market leader in solutions for professionals in the field of environmental noise and noise in the workplace. Brüel & Kjær offers courses and training, covering environmental noise measurements, in most major countries around the world. Classes are taught by local specialists as well as by application specialists from the company's headquarters. Brüel & Kjær Service Centres can be found in all regions. These offer calibration services and repair, including contracts allowing extension of warranty by up to 6 years. Brüel & Kjær is represented in more than 90 countries all over the world. For more information, please contact your local representative.